Far from passé – this classic won the war. This simple and unmistakably attractive cocktail was certainly America’s drink during the second World War when most spirits were scarce and Coca-Cola was still in good supply. While a the humble Rum & Coke has little snob appeal it is a refreshing drink especially with the addition of a freshly squeezed lime wedge. 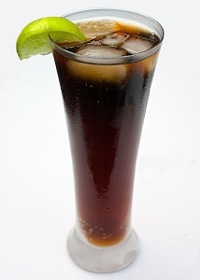 Have a classic Cuba Libre for nostalgia’s sake and then have another when no one else is looking. Squeeze the lime wedge into a collins glass followed by the Rum. Add ice and top with the cola. Stir gently to combine while being careful to not lose the cola’s carbonation.